First drain your chickpeas and rinse them vigorously. Pop them in some fresh water in a saucepan and boil rapidly for 10 minutes to soften. Will give this a go. It looks lovely and very affordable! It’s so tasty. I added fresh ginger, 3/4 tsp curry powder and 1/2 tsp mustard powder. TOP NOTCH…This will be a new store cupboard classic! I love your recipes and i’ve been looking for a good veggie curry. Thanks. I would also be really grateful if sometime, when you have time to post about your window herbs. I’ve had some before and they tend to die, go limp etc. any tips would be ate fully received. I tend to re-pot mine when I get them as I find the tiny supermarket pots aren’t adequate if you want them to go again. I put them in bigger pots and put big stones in the bottom to allow water runoff so they don’t get soggy and mouldy. I also shake as much of that cheap soil off as I can when I repot, and pop them in compost, usually £1 or so for a bag from Wilkinsons. I hope this helps! I always put mint in the biggest pot I can find as it grows like wildfire, and rosemary too. This blog is totally corrupt. I left a message earlier pointing out the fact that the prices quoted (15p for 10 vegetable stock cubes!) are completely absurd; it didn’t get accepted, but the above comment did straight away. 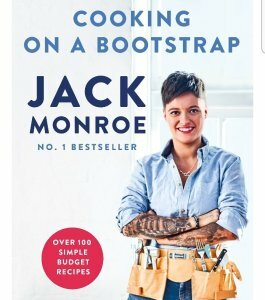 In the real world (which a girl called jack has clearly never experienced as she is both subsidised and ignorant of real prices), it is not possible to live on £10 a week; or £20 a week; or indeed £30 or £40 a week. Sainsburys Basics, 10 stock cubes, 15p. Stocked next to the regular stock cubes, and available in vegetable, beef and chicken flavour. I moderate all comments on my blog before they appear, as is standard procedure for high traffic websites, because of the risk of spamming. I haven’t got a ‘team’ – I do the whole thing myself, which means sometimes comments take a while to appear. 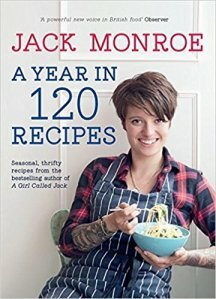 Nonomnom – I’m going to try this recipe out, thanks Jack. @Hilda Really? Because I’ve managed to live off £10 a week for the entirety of university and then some. I always knew I was magic..
Looks *very* good, Jack – thanks, will try it out. Just, oh, by the by – there was a letter to your school cookery teacher? The link doesn’t appear to work … and can’t find it on your site. Just me being …. not clever enough to find it? This sounds fantastic! What a delicious-sounding and hearty meal. And perfect during this blasted chill that seems to refuse to leave the UK. I made this for dinner tonight. It was delicious! I added chicken to mine, as had some to use up. I had thought I’d made enough for tomorrow, but my housemates and I all had seconds – a rare thing in our house! im dreading the changes to tax credits too i shall know more next thursday. I hate this time of year because all the new bills come in and they always go up but the income doesn’t go up to match. This is my 7th year of juggling bills around one wage. Cooked this last night. Didn’t have any apricots so used peaches instead. Made enough for two days but finished the lot – delicious! Also made this curry with peaches and agree it is delicious. I’m currently eating this as I type. It’s wonderful, though I did cheat slightly and used tinned chick peas. Still lovely and very filling. Thank you. I’ve made two of your recipes this week (this one and the smoked cheese, leek and Savoy pasta); both absolutely delicious (although substituted Cheddar for smoked cheese in the latter), served as great packed lunches the following day and even the little fussy britches liked them. Go for it, we will be watching on t.v. In the morning. You will be brilliant!!! Love from your fans in the I.O.M. Here’s an idea to save on fuel bills. I soak a whole packet of dried chickpeas overnight and cook them all at once, then freeze them. I put them in a large plastic bag and lay them out in the freezer as much as possible; then when they are frozen I drop the bag on the floor and they become free-flow! I do the same with kidney beans and I’m just trying mung beans. Will be trying your recipes after seeing you on BBC this morning. Thanks for the new ideas. Helen, that is such a brilliant inspired idea! 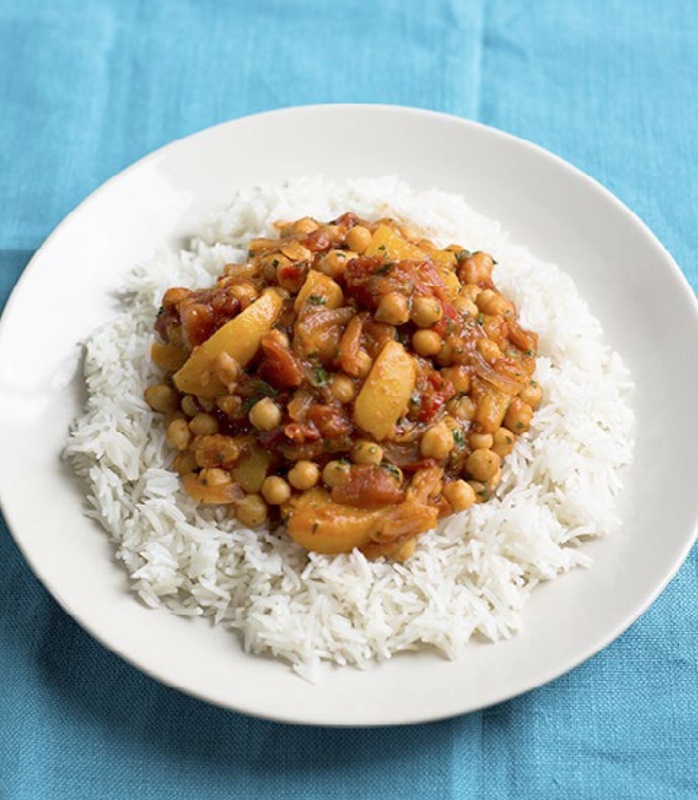 I cooked chickpeas today for this recipe and was thinking its a lot of fuel spent just cooking the chickpeas, so cooking a whole bag in me go the freezing is great fuel saving, and then makes it worth buying dried pulses. I’m definitely going to do this from now on. Hope jack puts this tip in her book as it will definitely encourage people to buy dried pulses then! I cook a whole pack of chick peas / dried beans in the slow cooker. So soak overnight first then cook all day/ night at little cost then freeze. They have a better, firmer texture too which is better for things like falafel. Made this tonight. Great recipe. I just came across your blog for the first time. You are awesome. I am so impressed by your grace, eloquence and resourcefulness. Well done! 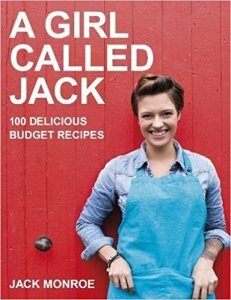 Hilda Masey – re: your comments about Jack never acing experienced real life as she is clearly subsisted and ignorant of real prices. Seriously??!! Have you even read this blog and Jack’s story? I just cannot believe your negativity and condescension, it is simply astounding. This blog is the outcome of someone experiencing extremely tough times and responding to it in a practical way. You sound very bitter. Could I ask the carton size of the chopped tomatoes? Could tinned tomatoes or Passata be used instead? Would it be ok to use tinned chickpeas in water if I can’t find dried? Looking forward to cooking this!! Hiya, it’s a 400g carton of chopped tomatoes, tinned ones would be fine as long as they don’t have any weirdy bits added like herbs etc that might throw it all off kilter… Passata would be fine too but I’d use less of it, as it’s runnier. Hi Jack, I’m a newcomer to your site (and an ex Echo employee! )- really love it. One question – would you boil tinned chickpeas prior to usage, or can I just chuck them in the pan? Thanks! Going to have this for dinner tonight. Your recipes all look amazing. I’ve got to say seeing you on bbc on Saturday was a real inspiration. Good to know I can go to your blog for food ideas when bills and other problems swallow any money I have! It was nice to have the leftover apricots for pudding too! I made this for us tonight (a family of 4) and my son had 2 bowlful a and daughter had 1 (she would have had more…but by the time she had finished there was none left!). It was absolutely delicious!!! Delicious, thank you! And very best wishes for your continuing struggle. I’m currently on a £3/day grocery budget (including cleaning stuff, etc.) so I’m beginning to think it was a godsend finding you. I have been so impressed by the experience I’ve had following your recipes so far (ask my friends… I can’t stop talking about it!) my weekly food shop cost was not only slashed but provided me with so much more than a week’s worth of food… I am a veggie (and a poor student) and rely heavily on fresh veg… which is great, but means that my food stock has usually run out about 4 days into the week, this week I’ve barely made a dent in it, I’m going to have a night off your recipes tomorrow and eat up other fresh things in my fridge which are in danger of going off (which never happens) and I have felt satisfied, healthy and full every night that I’ve followed your recipes (I’ve had 2 nights of kidney bean/carrot burger and 2 nights of this delicious curry so far). Can’t wait to select my recipes for next week! Just made this. Very tasty and cheap! I came across your blog whilst reading the Daily Mail today. I think you’re a truly inspirational young woman. I had, genuinely no idea people (with children) are forced to live like this. I feel fortunate of my life, but also very humbled about the amount of food waste we probably have in our house. Whilst I can’t promise to try and feed the 4 of us so cheaply, I will definitely be buying your book, I will endeavour to work harder to ensure our food waste is minimal and I am going to investigate donating food to a food bank. Good luck Jack. Your little boy has a mummy to be proud of. Now, THAT, made me cry! Sad that people are really so unaware of the plight of others, but wonderfully cheering that once they are made aware (and the press really needs to start telling the truth about this) they are so willing to try to do something about it! Taking this back to the US when I leave the UK in a few months. I’d love to see your weekly shopping lists! Cheers on a brilliant blog! this sounds really lovely, but apart from your shake of cumin it doesn’t really seem like a curry. The original (and now much adapted) recipe also used ground coriander, mustard seed, chicken, garlic and ginger – but I pared it back down for cheapness. I’ve got all the above spices you’ve mentioned in our cupboards and am planning to make this curry on Wednesday. Is there anyway you could add, in the comments, the quantities of the other spices? We like spicy food in our family! This was absolutely delicious. I doubled the recipe. Used two tins of chickpeas (because i didnt have dried) and a dsp of value curry powder instead of chilli. Feed 7 of us with a bit left over for my lunch following day. Absolutely delicious! I added 1 desert spoon of curry powder, as I don’t have any chillis. Think this will be a regular on the menu in our house from now on!! Just had this and it was lovely. I used a tin of chickpeas for two of us and added ground coriander, a teaspoon of the cumin and curry powder. Served it with brown basmati rice and mango chutney. Yum! I have made this 4 times now, each time adding/substituting something. First, i subbed the chickpeas for kidney beans, the second time i added a handful of red lentils (REALLY delicious addition! ), and then the 3rd time i added some chopped up veg (lurking at the bottom of the fridge). Each time it has been delicious! I have to admit that i had never considered using tinned apricots in a meal, and the idea seemed slightly..umm..mad (Sorry Jack) when i first saw the recipe. But now its one of my favourite meals. I serve it with home made nann bread, or rice, or cous cous. We had this for tea tonight. My children 3 and 5 years loved it. In fact they love every recipe I have made from your blog which is amazing as normally meal times are a nightmare. Every time I have make one of your recipes they sit still and just eat. We aren’t hard up but we are really inspired by your story and outlook. We are spending more time thinking about what we buy, how we cook it and preventing waste. We are saving money which is great as we can treat ourselves in other ways and can continue to support our local foodbank. Thanks Jack. Can’t believe how gorgeous this dish is, I did it for my dinner last night and can’t believe how yummy it was, I would never have thought of putting apricots and chickpeas together, this is defo one I will cook over and over again. I “found you” today after hearing you on Radio 4. We’re vegetarians on a budget (and husband doesn’t eat dairy but we can find substitutes) so a lot of your recipes are perfect for us. Thank you. You’re a modern day hero but I can appreciate you probably don’t feel like one especially when times are at their toughest. I am sure many people have found your blog at a time when they felt they had nowhere else to turn and I’m betting you’ve really helped them get something to eat on the table. Absolute best wishes to you Jack. wow ,just made this for my family, it was delicious, will try making it with beans because my husband has a big painful problem with chickpeas !! Where can I buy 600g of turkey for £1.75? It’s a huge turkey drumstick from the Sainsburys Basics range – that 600g does include the bone! I made this curry with the Turkey Drumstick (yes, the big one) and it’s lovely. Made this last night, although added garam masala, chilli powder and ginger to give it more of a kick. You’re right, delicious cold in a pitta bread for my packed lunch today! Made this tonight, as usual with a few alterations to suit my cupboard (tinned chickpeas because I couldn’t find dried when I did my online shop, chilli powder not fresh, dollop of chilli sauce just in case, curry powder not cumin, fresh apicrots because i had some cheqp ones starting to wrinkle in the fridge, black pepper because no stock cubes, passata not chopped….). Most if not all the recipes on here are fairly quick to prepare and cook but even quick meals like this can be a struggle in our houses as we are always in late after doing our animals and then a child to get to bed. Tonight I cooked the onions and spices and then shoved everything into a le cruset. Lid on and and into the oven at 150 and 2 hours later when we got back the most delicious curry. Yum. I think I need a decent rice cooker now so that we can also put the rice on before we go out to do our animals. Hiya Jack. I make this a lot and take out the chicken stock and replace it with veggie because I’m vegetarian. I made this tonight and added a dollop of onion chutney to it as well as using onions and it gives it a lovely tangy taste. I thought I’d share it. Keep up the good work, I always feel excited when I see a new recipe. A bit of cumin and a shake of chilli does not make a curry- it is spicing more akin to middle eastern and Turkish food. Very disappointed by most of your Indian inspired recipes. Put a desert spoon of curry powder in then, like I do. Any recipe can be adapted to suit ones own personal taste. It’s really not rocket science!!! Looks fab, just got introduced to you by a friend who bought your book, and you are a true inspiration, thank You. you use alot of fresh coriander in your dishes which I LOVE, but am not good at growing it. would you use dried coriander to substitue? if so how much per handful of fresh? thank you again, you have been a fresh air to find! This is one of the most delicious things I have tasted! My little ones are super fussy – do you think it would still work with a can of baked beans instead of the chickpeas?! I tried this peach & chickpea curry, and it’s great. Very tasty and easy to make. From the recipe book I regularly make the mushroom stroganoff too. The banana tea loaf has morphed into banana muffins, and I love the mint & courgette fritters. 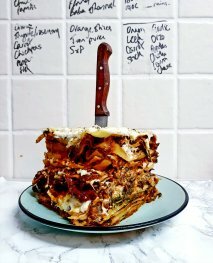 The best compliment I can give a cookbook is that I use it, instead of just leafing through and looking at the pictures. Even though the book contains many meat-based recipes it’s still got plenty in for us vegetarians. Will make tonight. After years of being low meat I had drifted as lil’ boy defines food by meat and anything else that he will avoid. I have been slowly inventing recipes that he will go for, and this looks another great dish to try. Thanks! This looks really nice. A good veggie curry with a twist. Really different. Thanks for sharing. Great recipes!! Thank you so much for sharing these, we are truly inspired!!! We would like to add your agirlcalledjack.com to the Top Food Blog list in myTaste.com/ with over 4 million users worldwide… Your blog is impressively BEAUTIFUL and deserves to be included on the Top list!! We will feature your blog and create shout outs about your recipes to our fan pages. I just discovered your blog and your lovely recipes! Thank you for sharing them 🙂 I made the curry in my slow cooker, served on brown rice. I also added a couple if extra bits I had kicking around, frozen peas an some sad potatoes. The family and I will be happily eating this over the next few days! Tried this last night. Thought fruit in a curry would be controversial but the flavours work very well (it’s not too sweet) if you add sufficient chilli. Nice one Jack. Hi Jack, Just made the Peach & Chick Pea Curry for the first time! Delicious! Will be able to get about 4 meals out of what I made! Having Bulgar Wheat rather than rice though! (trying to be healthy!). Hi Jack, greetings from Australia! I told my boyfriend I was going to make this for dinner yesterday morning to which he was a bit skeptical…anyway he comes in through the door last night and declared that it smelt great, subsequently eating two bowls for dinner. So, for the people who have complained that it’s not curry-ish enough – give this a go – it tasted wonderful! Well done, Jack! Thanks for this. Cash is a bit tight at the moment and this site is a godsend for affordable healthy meals. Thank you! Delicious! Like a couple of other people above I’ve done this a few times and each time added an extra layer of spice to the dish and any leftover/frozen veg of course. I cant thank you enough for this one… hit all around. My kids loved it served with rice and naan bread and even my curry hating friend adored it and has planned for me to make it again! Added a little gram masala to the receipe to our taste, I doubled up and made a big batch which tasted even better the day after. Cheated with tin chickpeas I needed to use up. Everyone must try! Can this be frozen? Looking for batch cook recipes I can cook and freeze then preferably cook from frozen. Knee op this Tuesday and my husband will be taking care of me,the kids and working at the same time so want to be prepped! Absolutely loved this and so did the grumpy meat eater. Thank you Jack, for sharing. I made this last night, using mandarins instead of peaches as per your suggestion in the recipe and it was lovely. Definitely going to be a regular dish in our house. A small pinch of the flakes! I just made this curry it was delicious. Used mango instead of peaches as that’s all I had in the cupboard seemed to work. Am going to try to make other meals too. If I only have access to powdered chili pepper and coriander, how much of each should I use? Absolutely love this curry – it’s a staple in our house. In fact such is my zeal for this dish that nearly everyone I work with has been made to give this a go and has adopted this into their repertoire too! I do find that I have to up the chilli and spices a bit for some more oomf and would also recommend throwing in a handful of frozen spinach for the last 5 minutes of cooking as well for a bit of added depth. Delicious! This is so simple & delicious! I had this at a friends house and thought it was so good I got the recipe off her! Absolutely delicious an I normally hate curry!! Thank you for this recipe! Hi Jack! Just wanted to say I’ve cooked this lovely dish for lunch, and it is a total winner. I will be definitely cooking it again. Many thanks for the inspiration! I had a lot of doubts when I saw this in the pan. My son remarked that it looked a lot like the recipe cards from the 1960s which we used to write spoof captions for. But I trusted you, and despite not liking pulses at all, enjoyed the curry, as did my vegetarian guest (and she asked for the recipe). So… be not of faint heart when you see it sitting in the pan all together for the first time… it IS delicious! Cooking a curry right now!!! Never thought of peach though. I added pineapple to mine. Will try next time ? This is my go to meal when I’m either skint or working and need something quick when I get in. I use the peaches with syrup, not as healthy but cheaper and tastier, I tip the lot in. Love it. This is one of my favourite recipes from the first book. I make loads and shovel it into pittas for lunch too. Now that you’re vegan you might consider advising using the chickpea water as an egg replacement ? Thanks for the recipe Jack. Tried this last night with my kids helping to cook. Must admit I wasn’t convinced by the peach so we did 2 batches – the other with boiled potato. Youngest & I preferred the potato one, eldest liked the peach. Peach one had more moisture due to the juice, so added water to potato one. All in all 3 happy punters, much appreciated. Had some ingredients but had to stock up on others, spent around £7-8 I reckon but if we had got a take away then we’d be talking about £30. Main motivation for this was to cone up with new vegetarian meal options for my youngest; she’s been vegetarian for about 6 months now and we find it hard at mealtimes. I’ll add something to the tip jar, cheers.